Enticed during a luxurious book store peruse by its moody cover and hints of ghostly paranoia, I added S.L. 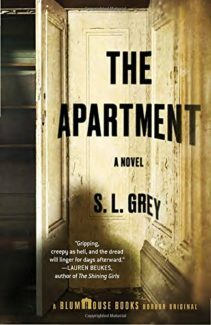 Grey’s The Apartment to a growing pile of to-be-reads and promptly forgot about it – until Halloween decorations and leering pumpkins began showing up everywhere. In the mood for a new author I started The Apartment with the usual level of giddy excitement and soon became drawn into an Alfred Hitchcock-esque story that concentrates on palpable paranoia and the seeping poisons of human mental fragility engulfed by barren expanses of empty, abandoned space where anything can happen. The story fluctuates between the quality of a surrealistic nightmare and a traditional thriller with that hint of ghastliness slithering beneath the surface that gives the book its horror genre label. But The Apartment is about way more than horror, hacksaws, and screaming midnight runs. Here, the tangled underbrush of the mind and the unseen coalesces to bring together something intensely devastating that will rend not only the body, but the minds of our unfortunate protagonists. The novel opens with a hidden welter of past failings and terrors. These are the underpinning of a marriage, already shaky, and a husband, mentally scarred from the dissolution of a previous marriage after the traumatic death of his young daughter. We sense within the first few pages that between Mark (the haunted husband) and Steph, something warped but indefinable is growing. Something they will never directly mark or articulate, but that throbs and pulses between their stilted conversations and half shrouded animosities. Take this cauldron and throw in a definable incident – a home invasion in which Mark fails the test of a “man” and “husband” and you have the recipe for what will transition from a story of dissatisfied marriage into a tangled horror of fear and the supernatural. From here, Mark and Steph embark on a “cleansing” journey, all based on the suspicious recommendation of a friend with ulterior motives. Paranoid about home safety, Steph joins a house swapping site and agrees to leave behind the newly barred Cape Town house for a getaway to romantic Paris. Meanwhile, the Paris apartment owners, the too-good-to-be-true Petits, will be taking residence in Mark and Steph’s Cape Town home, and hopefully cleaning out the ghostly memories of invasion and betrayal. 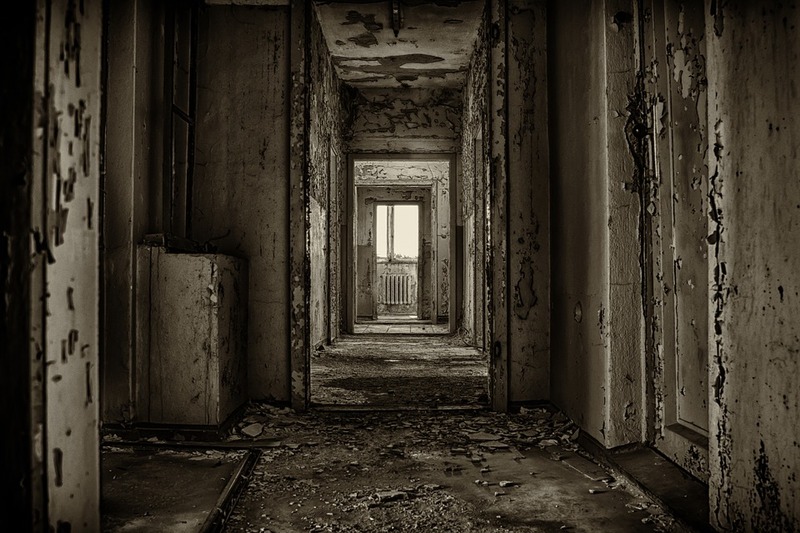 Only, of course, the Petits never show up and the promised Paris apartment is an abandoned building with one other senile resident and a shocking sense of malevolence only surpassed by its decrepitude and isolation. Enter the phantoms that chased our protagonists from one continent to another and the slow degeneration of both mind and relationship. The Apartment immediately besieges readers with a sense of unease that marches across our skin like static electricity or an invisible horde of insects. The story itself plays with everything from perception to time, using the fracturing nature to showcase how little we know and how unreliable – even insane – our narrators are. We start in the middle of things, an ominous sense that the worst has already happened and the survivors, peaking out from the carnage, are giving us fits and starts of a story while still plagued by a numbing shock. This entire vibe, sustained throughout the novel, creates most of the atmosphere which again, comes not from what is seen or even known, but from what is half perceived. An incomplete puzzle, readers stare at the weird shapes of missing pieces and along with the characters, begin to form a twisted picture of ghosts and inconceivable sins. As the moving pieces come together and then fade, Steph and Mark alternate narration; events, however, aren’t retold through separate prospectives. Instead, the show goes on and the sense of what’s not known by the current storyteller (either Steph or Mark) is an added stimulant in a potion of murky unease. As Mark and Steph’s stay at the apartment extends and strange occurrences lead to further unease, the couple’s own financial situation and reluctance to give up on a trip that symbolizes the repair of their marriage eventually leads them to become stuck in an inescapable litany of unsettling circumstances. Admittedly, this is where most horror flavored books loose the sense of reality and readers begin to comment about the intelligence of characters who see supernatural events and yet continue to stay instead of just leaving. S.L. Grey, however, is very careful to ensure that the unease is subtle, the situations themselves not necessarily perilous so much as bizarre or indicative of mental unease which the characters (Mark particularly) are afraid to admit much less confront. When the eventual escalation leads to events that cannot be ignored – and bloodshed on top of that – the scene is well laid to keep the characters believably trapped. 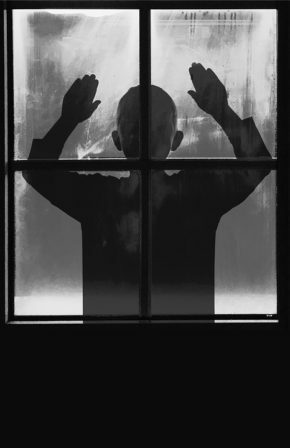 The tension mounts as readers curl into defensive balls, startled by every dark shadow creeping through our own homes or creaking over floorboards just out of sight. What you expect to happen and what happens are two totally different things, and here audiences are divided strongly. A simple read through the first page of Amazon reviews shows audiences angered by the lack of a full explanation and the blood and guts which usually follows along with the horror label; others are mesmerized that the sense of mystery persisted, the supernatural peripherally explained and yet, still so unknown that it could come after you, or me, or anyone. I’m of the later camp myself – an unusual position for me since I hate intuiting things and like to have my mysteries wrapped in multilayered explanations. But here, with the amorphous fear that is suspended between the real, the imagination, and a traumatic past, it all makes sense and we close the book saying, “ah, but of course; it had to end like that.” How you, as a reader, will feel depends on your expectation going in and your definition of horror. If you like the splatter-fest Friday the 13th motif, The Apartment is going to leave you cold, scratching your head and saying “what, that’s all that happens! ?” If you want a mystery that remains enshrouded to some degree, up to the power of your own imagination’s terribleness, and a sense of psychological and mental tension heightened by a few key scenes of a disturbing nature, you’ll get your fill here and be searching through Amazon for further books from this author.